Spoilers from Sunday’s Game of Thrones episode are in this article. If you haven’t watched and don’t want to know all of the details, head out now. If they’re following the Western code, he’ll seek to avenge me, then continue his life in a different way. You have to have revenge, and expedient revenge. I don’t believe in the death penalty, but I understand personal vengeance. How do you reconcile those in real life? In film, you can do it very easily. You show somebody has been wronged and therefore their morality is in the right place. The episode was set up rather cleverly, with McShane’s character and Sandor Clegane talking philosophy and the need to reconcile ideas with the practical knowledge that there will always be danger and violence present. They reached an impasse during those conversations, with McShane’s guru feeling as if he could lead his flock and survive in a peaceful manner while Clegane felt that weapons would be needed, and soon. Obviously, The Hound's warnings ended up coming true before the end of the episode and McShane and the rest of the group perished because they didn’t heed those warnings. However, that doesn’t mean that The Hound wasn’t effected by the loss of his new compatriots. He was, deeply, and McShane's comments to EW make it clear he believes that will affect the character’s trajectory in the episodes moving forward. Mostly, it means that the Brotherhood Without Banners should be on guard. The Hound was one of the most formidable fighters in Westeros before he was nearly done in by Brienne’s fighting skills and Arya refusing to kill him. 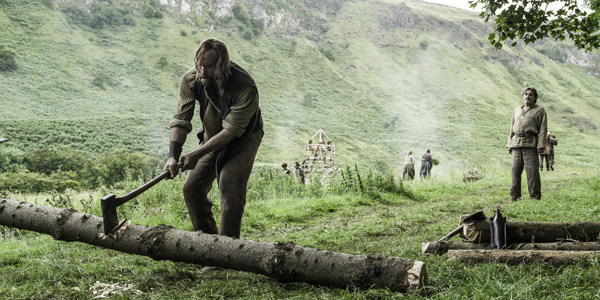 McShane mentioned during the episode that when he found The Hound,he thought he was dead. He didn't seem to be breathing and he even had bones sticking out of his body. He thought The Hound was going to die, but he didn't. Now, it turns out that Sandor Clegane's survival might directly effect the efficiency of the Brotherhood Without Banners moving forward. The Brotherhood Without Banners was created as an anti-Lannister group, but they aren't necessarily Robin Hood-type good guys. In fact, their actions during the episode showed even more in depth how the group is capable of preying on people who land in their path. I would not want to be in the Brotherhood when The Hound finds them, as I agree with McShane that it is not going to be a good look. Luckily, we shouldn't have too much longer to wait to find out. New episodes of Game of Thrones air on Sunday nights at 9 p.m. ET. You can find out more about what else is coming up on the hit series here.